A very clean and we'll kept park. Minimal road noise. Outstanding bargain. We camped at Sunrise RV Park in a Motorhome. Basic gravel lot with hookups. No grass. Works well for an overnight. We camped at Burlington RV Park in a Motorhome. Seasonals have taken over. 3 or 4 very poor slots available. Gravel spots are overgrown, the pedestals falling over. cable connections don't work cable laying on the grounds. A lawnmower has not seen this area in quite some time. Electrical wavered a bit as the night went on. Sites are very short. The 'owners' no longer staff the office. Someone drops in late in the day. Pool is closed (even in season). I am sorry to say this place is darn near gone. NO 50amp or sewer in overnighter area. We camped at Athens I-75 Campground in a Motorhome. Applebee's across the street is about it in the near area. Just an update of my 2014 stay. Still a great value for a basic site. Picnic tables and clean service building with laundry. Want to try finding crystals in tailing? THIS is the spot to camp. We camped at Ron Coleman RV Park in a Motorhome. The Shack has wonderful food and Ice Cream. Exactly 4.0miles from camp, return to Ar7 and go North on left across from School. No credit/debit cards accepted. Pretty much anything fried you could want. Amazing burger. Rude check-in staff. The rest of the crew seems nice. Forget the oceanview sites, all you see are dunes and you can see them from anywhere in the camp. Sites were OK sized and level. Cement pads were good. Not a lick of shade anywhere. Back-in ONLY. There is very little in the immediate area, so be prepared to drive or bring your own. The 'world class' claim is a joke. I have stayed in far better places far less expensive with more around them to do. Pool was closed due to weather, understood. But the indoor pool too? I was unaware. A word of caution to the disabled, there are few local business that have ramps. Most businesses have a few steps up to keep them out of storm surge and they have all been grandfathered for ADA. Be prepared to sit in the car a lot. We camped at Camp Hatteras RV Resort & Campground in a Motorhome. No restrooms/showers in the area we were set up. Staff was quite friendly and provided accurate answers to any asked questions. Pretty pricy for what a one nighter gets.Unable to use the amenities as they are in a different area and not easily accessible. Packed in pretty tight. I'd stay here again if the need arose. We camped at Fox Den Acres in a Motorhome. As we drove past many owner sites, the one thing that stuck out was how dirty this place is. Grass is well kept and security is good. Very crowded with owner rigs, but most far out of date and in desperate need of maintenance, both site and vehicle. Never again. Why RSI would even want to claim this place is beyond me. We camped at Wilderness Presidential Resort in a Motorhome. Restrooms and Shower are not handicap accessible. No big deal, isn't that why we have our own? :) Staff is here only on very limited hours. This is not an issue until you need the wifi code. you MUST make reservations online. If you do not create a user account PRIOR to making a reservation you will NOT get any discounts. If you camp after Sept 1 expects double rates. This campground exists for the Football season. Office hours are only during what is considered to be the prime time. approx 2-4pm. The Wonderful woman that was there in the time window made up for any service shortfalls. The sites are quite small and the entire area is hilly. Be prepared to climb. Once you manage the maze of getting to the campground STOP at the stop sign in the middle of the campground and walk down the hill to the office. If you happen to arrive outside the few hours they are there drive to your spot. Avoid driving past the office. Oddly there seems to be a car or two blocking the way. Each site appears to have a grill and a nice table. There is no pool, the water park has been closed for 3+ years. Would I stay here again? Sure! As long as is wasn't football season and I HAD to stay in Auburn. $40 for nothing more than electric and water? Really? 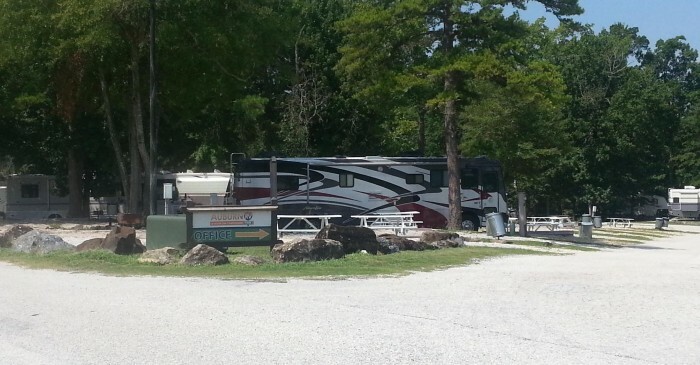 We camped at Auburn RV Park at Leisure Time Campground in a Motorhome. Nothing nearby. Do NOT get ribs from Nick and Jim's took a hammer to get them off the bone! This was a 30amp site. Lots of seasonals,every site was clean. WiFi reached to the end of the row on my PC,but too weak for cell phone data. Very pleasant management. This is an outstanding overnight spot. Freeway noise was present,but not horrific. I'd stay here again in a heartbeat. IMPORTANT:Make reservations as soon as you decide to stop here. Darn near didn't get in and it wasn't a 'prime time' day. Nothing really around so have your supplies before you get here. I did not look through the onsite store. There is an RV tech onsite. Sites fairly level could use gravel. Roads gravel and ok. We camped at Texas T Campground in a Motorhome. Make sure you get reservations! The owners live off property, extremely friendly folks. It is excellent for an overnight. There were a number of back in spots if the pull through sites were taken up.I didn't feel it was run down. The lawns were well cared for and the park was clean. We will be back when we need a spot with electric and water overnight stop. We camped at Grizzly's RV Park in a Motorhome. At $12.50 per night, $300mo this is a super park to base quartz mining. There is only one pull through. Big rigs can easily fit in the spots near the entrance. The perimeter road is paved as are all the sites. Very basic services, but quiet and a peaceful.We have stayed here many times. We camped at Ron Coleman RV Park in a Motorhome. Nice overnighter park; easy friendly management, clean, quiet campsites. Gravel roads could use some pot hole filling, but it's better than speed bumps. Sites were long enough for a 36ft plus tow..easily. I'd stay here again. 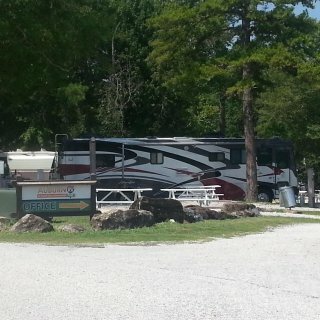 We camped at Marion Campground & RV Park in a Motorhome. Very few overnight spots right now. Filled with pipeline workers for local projects. Clean and pleasant. Overhead lines aren't a problem. We didn't use the cable. The area was well kept and the owners were quite friendly. My spousal unit made the trip inside, but one of the owners came out to say 'hi' and check me out. He knows who is supposed to be there. I did not hear freeway noise at all. Most spots would have a problem with Sat, lots of shade. Sites were a little short, but we fit well with a 36ft and jeep. I stay here again. We camped at Athens I-75 Campground in a Motorhome. Base Camp for crystal mining or fishing. Minimart and restaurant in walking and wifi distance. No services at all. Basic cable is $2 and 50amp is $3. Rental trailer available. Seasonals on site. We camped at Marilyn's RV Park in a Motorhome.